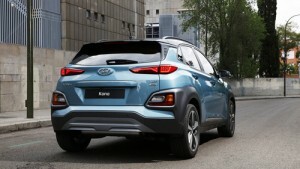 As part of an ongoing assault on the exploding CUV and crossover market, the new Kona is poised to shake up its category. Taking aim squarely at established competitors like the Mazda CX-3 and Honda HR-V, the Kona is targeting youthful, pre-family shoppers with its rugged, versatile, aesthetic, comfortable and well-appointed interior, and seven vibrant paint colours to help it stand out. Choose from colours like Pulse Red, Surf Blue, and Lime Twist. Interior options include black, black and grey two-tone, and black with accents that match some of the exterior. Kona should arrive in Canadian dealerships in the first half of 2018 and most in the know expect it to be a big hit. Kona’s new platform is the same as the Elantra sedan’s and borrows a similar suspension setup of struts in front and either trailing torsion beam for front-drive models or a multilink setup for all-wheel-drive models that mirror those on the Elantra GT Sport. Aggressive 18-inch wheels wrapped in 235/45R18 tires look great and suggest segment-defying handling. When compared to the top sellers in the subcompact CUV segment, the Kona comes closest in dimensions to the Kia Soul—it’s an inch longer, has an identical width, and is 2.5 inches lower on a wheelbase 1.2 inches longer. The Kona measures 5.1 inches shorter in length than the top-selling Honda HR-V, with much of that coming out of the Hyundai’s 5.1-cubic-foot-smaller cargo area. But, the rear seats do fold flat and the cargo floor can be lowered 3 inches for taller loads. 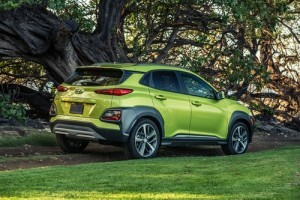 Hyundai has no plans to cut corners where safety is concerned and will offer a full roster of safety gear on the new Kona, including forward collision alert, lane keep assist, high-beam assist, blind-spot collision warning with a lane change assist feature, rear cross-traffic collision warning, parking distance warning in reverse, and a rearview monitor with dynamic parking guidance lines. A new feature to the segment is a driver-drowsiness warning that monitors lateral movement in the lane, sudden steering inputs, or lane drift. There will be plenty of premium features as well, including leather upholstery, wireless phone charging, and an eight-speaker Harman Infinity audio system with a subwoofer and an external amp will also be available. Apple CarPlay and BlueLink telematics will connect with your smartwatch or Amazon Alexa systems. 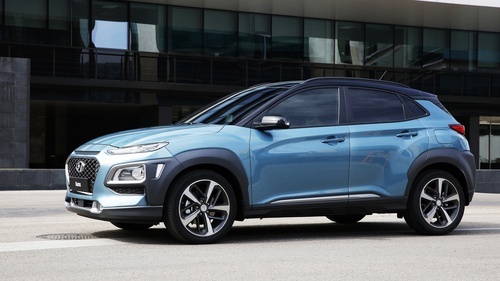 If a compact CUV is in your future, make plans to drive the all-new Hyundai Kona. If early reviews are any indication, this new model should prove to be another home run for Hyundai.